The azimuth thruster usually consists of three installation methods: transom installation, well installation and deck installation. Transom installation is suitable for ship types with small cabin space, such as passenger ships, floating cranes, inland and coasting vessels, etc.The sealing plate is fixed on the stern beam.The azimuth thruster is bolted on the plate.The upper part of the azimuth thruster is clamped on the pin shaft, and the lower part is clamped on the thrust ring. When the thrust ring is loosened, the azimuth thruster can be tilted up around the pin. 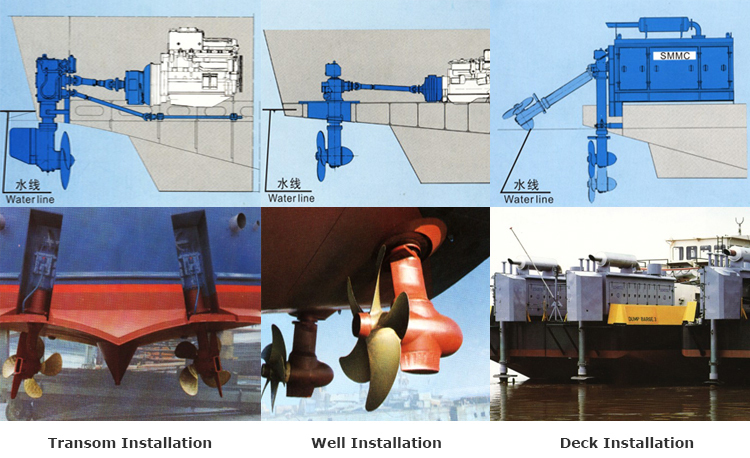 Well installation is particularly suitable for tugs, ferries, floating docks and survey vessels.Well installation azimuth thruster combing thruster and rudder.The underwater parts including propeller, lower gearbox can steer free at 360° range. Driven by electric motor or diesel engine, the propeller prodeces omni-directional thrust,Greatly improved the flexibility of the ship. Deck combination azimuth thruster is a kind of marine propulsion which combines azimuth thruster and diesel engine or electric motor.The model has the advantages of compact structure and high maneuverability,etc. The whole unit can be directly installed on the deck base and covered with a container shell, so that the ship can adapt to the large draught depth change and exert the maximum thrust to better meet the requirements of full load and no-load propeller immersion.